One of the desired military capabilities resulting from this new form of visual intelligence is a smart camera, with sufficient visual intelligence that it can report on activity in an area of observation. 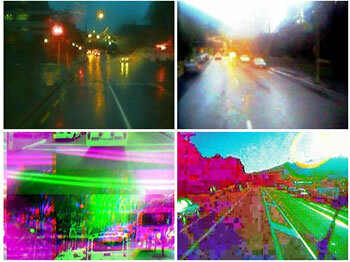 A camera with this kind of visual intelligence could be employed as a payload on a broad range of persistent stare surveillance platforms, from fixed surveillance systems, which would conceivably benefit from abundant computing power, to camera‐equipped perch‐and‐ stare micro air vehicles, which would impose extreme limitations on payload size and available computing power. For the purpose of this research, employment of this capability on man‐ portable unmanned ground vehicles (UGVs) is assumed. This provides a reasonable yet challenging set of development constraints, along with the potential to transition the technology to an objective ground force capability. While DARPA is handing out money, they should also talk to the creators of this real-life film-making robot, which is able to analyze individual film frames and then join the best parts together as a finished film. From The Mind's Eye (pdf) via Wired.